The EPOS3 70/10 EtherCAT digital positioning controller is designed to meet the high demands of real-time positioning of synchronised multi-axis systems. Designed for DC and EC motors with a power range up to 700 Watt, it provides excellent uniform running for motors equipped with incremental encoders. The extremely compact EPOS3 possesses a wide nominal power supply voltage range from 11 to 70 VDC and delivers a continuous output current of 10 A during acceleration and deceleration even up to 25 A. The EPOS3 70/10 EtherCAT easily integrates as slave into real-time EtherCAT protocol-based Ethernet networks, and with the provided device description file and device-specific configuration guide in a Beckhoff-TwinCAT environment. Multiple operating modes allow efficient, flexible use in a wide range of drive systems in robotics, automation and mechatronics. 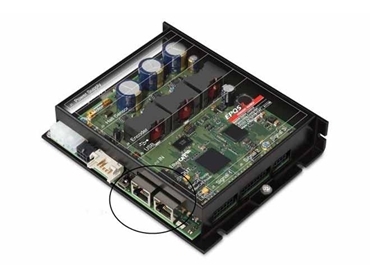 The positioning controller supports a broad bandwidth of encoders. In the typical EtherCAT modes «Cyclic Synchronous Position (CSP)», «Cyclic Synchronous Velocity (CSV)», and «Cyclic Synchronous Torque (CST)», the EtherCAT master calculates the trajectory points and sends the target parameters cyclically and synchronous via EtherCAT network to the EPOS3. The corresponding control loops for position, speed and torque/current take place in the EPOS3, which, in turn delivers the measured actual values (position, speed and current) to the EtherCAT master. The EPOS3 70/10 EtherCAT is equipped with superb motion control functionality for the actual drive control. For example, in «Profile Position Mode (PPM)», the calculated path is followed highly dynamically and with high accuracy. A bundle of additional features such as speed control with given target velocity in «Profile Velocity Mode (PVM)» and «Homing» to a defined mechanical position using numerous implemented methods is available. The generous number of inputs and outputs makes the extra EtherCAT I/O module obsolete. Digital inputs/outputs (11/5) can be configured as reference or limit switch as well as Capture or Trigger, or can be used to activate holding brakes with definable ON/OFF switching delays. Additionally, analogue inputs/outputs (2/1) are at free disposal. Perfectly tailored for servo motors, the EPOS3 70/10 EtherCAT digital positioning controllers offer built-in motor filters with motor chokes for EMC-conform operation. Prefabricated cables and perfectly matching accessories simplify installation and commissioning. The controller offers comprehensive circuitry against overcurrent, excess temperature, undervoltage and overvoltage, against voltage transients and against short-circuits in the motor cable. The digital positioning controllers are also equipped with adjustable current limitation to protect motor and load as well as protected digital inputs and outputs. The «EPOS Studio» serves as user interface for efficient parameterization employing a number of smart and clever functions and intuitively designed wizards to simplify tasks such as firmware download, automatic controller commissioning, I/O configuration, and test and data recording. A USB 2.0 port is available as an alternative to the Ethernet interface for commissioning and diagnostics. Maxon Motor Australia is a leading supplier of high precision DC servo motors, brushless motors and drives.